I swear I heard a rumor that its springtime under these frozen pine limbs but it was so blustery this morning on my hike that my iPhone simply refused to turn on whatsoever. One minute my frozen iPhone went from sixty percent battery to three percent battery as I was trying to take a selfie of my frozen dog and I. This was a half mile into what was supposed to be a half day ascent up into a snowy wilderness. Oh, poop. Not having a working cell single starts to get me a bit paranoid when out in the wilderness and far away from society and rescue helicopters. 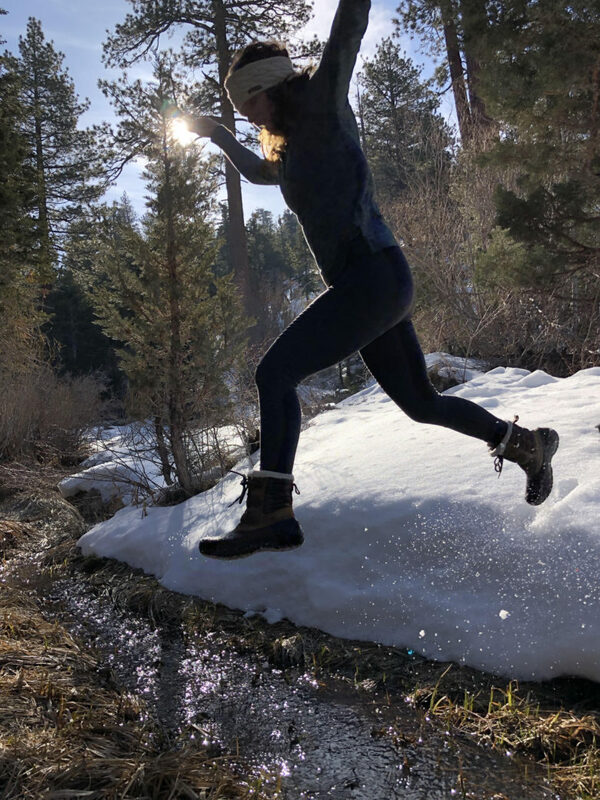 As I trudged up the mountain into the snowy frigid morning, The next moment the windchill had convinced my iPhone to save the selfies for another day and what felt like a brick of ice in my hand shut off. Now normally I can live for a few hours without being plugged in, checking my Instagram or updating my Twitter but when you are hiking up a desolate mountain into an empty frozen wilderness where likely another sole will not wander on a Monday, it feels good to have a working cell phone in your pocket. This was just after dawn and it was twenty degrees out when I started my ascent up Sugarloaf mountain. The trail was a solid sheet of ice going nearly straight up and if I had remembered my cat trax or my hiking poles maybe I would not be quite so paranoid on this, I swear it was springtime morning, but I just had this vision of slipping on frozen ice and breaking a leg or two. Okay, that could be, because I was once hurt unbelievably badly on this very trail. I’m not going to sit here and say that I might be accident prone but let’s just say my boyfriend insists I leave my google tracking on all the time now so he knows where to look for my body. I think he’s joking. I remember the bad fall and texting my boyfriend “I’m hurt bad and I think I can see a bone in my knee but I think I can walk the two miles back to my car. So don’t call search and rescue just yet” I did manage on that day to limp back to my parked SUV and that day was such a lesson on why you always, always bring first aid supplies on a hike. The fact that I forgot on this chilly morning the important snow gear that could keep me from having a terrible fall on the ice was just amateur hour when it comes to planning a safe hike. I blame it on the fact that I got up before dawn for this snowy hike, and also that I couldn’t feel my face when I started the hike. 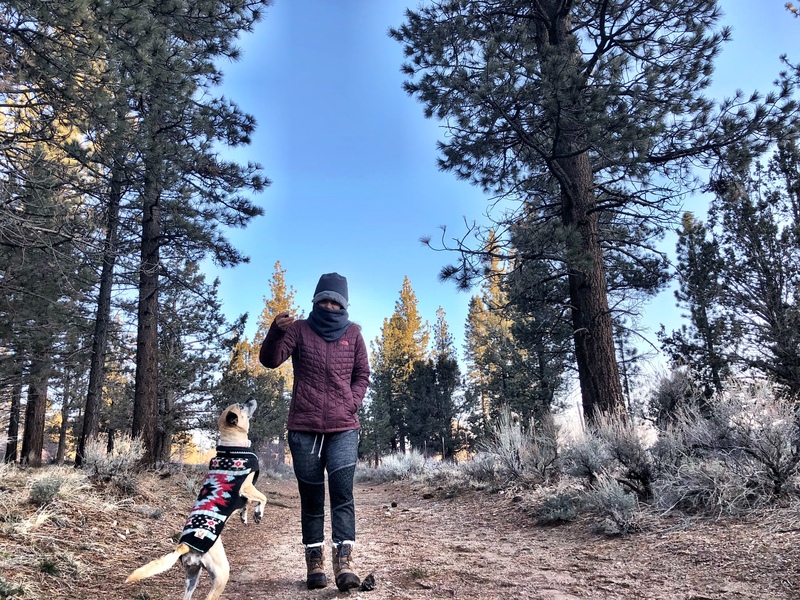 As I fought my way uphill into the snowy forest and up the single track trail, I couldn’t recall the last time I went for a snow hike and my dog was actually shivering on the hike. It was that blustery cold this a.m. It was just too cold for selfies, little dogs in sweaters and 2019 technology. Once again; this is supposed to be springtime. I’m starting to feel like that might be Fake News. 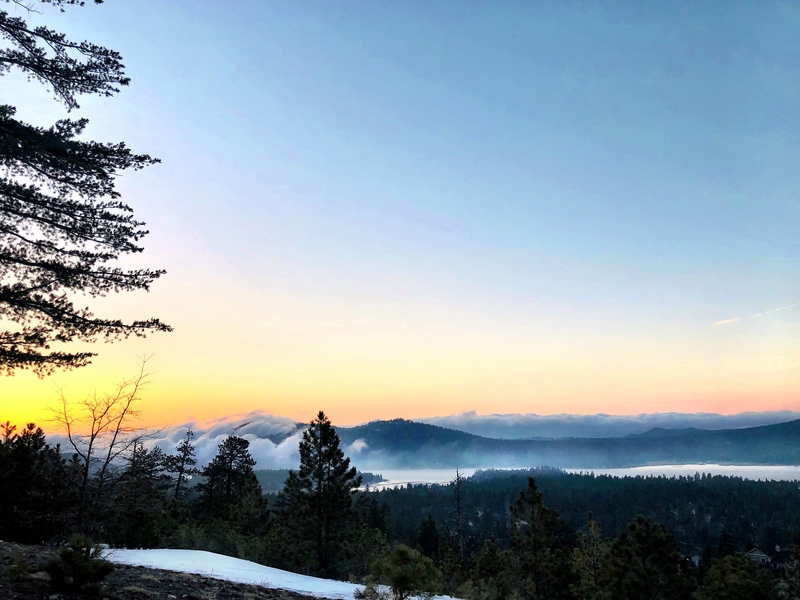 Yesterday the pup and I hiked twelve miles throughout the course of the day, ending our Sunday with an amazing sunset hike as the fog was rolling into our forest. That layer of thick mist could explain why it was just ridiculous cold this morning as we were unsuccessful in our Mt Sugarloaf Summit. Amazing sunset last night though and we did have a fantastic time on the trails this morning, not getting hurt and enjoying this “Fake” spring day. Here’s to a nice warm spring ahead any many trails, mountain and miles summited! I’m linking up once again with YeahWrite.Me for all the creative writing fun this weekend! Wow, the landscape where you live is amazing. Sadly some of the photos didn’t load. I envy you having such beautiful wilderness at your fingertips! I didn’t think cell phones could shut off due to cold, until recently when my Samsung Galaxy abruptly quit on me while I was walking the dog on a cold day and had the phone out talking to my aunt. That was a first. I’ve had my cell phone shut off a few times due to cold weather – it was so weird!